Body Solid SPR 1000 Power Rack Reviewed - Includes Video! There are not many racks on the market that can beat the versatility and build quality of the Body Solid SPR 1000 power rack. This is a tank of a rack built to be extremely durable and solid, the 11 gauge 3″ x 3″ frame can hold a massive 1000lbs making it desirable to even the most extreme of lifters. Whether you are buying this for commercial use or home use the rack has been built to take a beating, its one of the best priced commercial grade racks on the market, our detailed review will cover everything from the pros, cons, to the wide variety of attachments. And don’t forget to take a quick look at the video at the end of the article where you can take a much closer look at this beast of a rack. Measuring 90″ tall the rack has been designed perfectly for pull-ups, standing presses, and other exercises, although it would fit nicely inside most garages, you may not have the clearance needed for pull-ups. With power racks it’s best to estimate an extra 12″ in height to the racks pull up bar height, this allows you enough room to do pull-ups comfortably. It’s important to take this into account if you are buying this rack for home use. There’s no doubting this rack is solid, 11 gauge oversized 3″ x 3″ tubing will assure there’s not much movement with the rack. In general, the weight of a rack provides a big clue to the overall stability, and at 370lb this rack is one heavy beast, and its racks like the Body Solid SPR1000 that are wide, deep with heavy frame gauges will weigh the most. 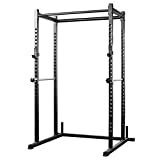 Compare this rack to the cheaper racks weighing 100-150lb and you will see why at more than twice the weight this rack is going to feel like your training inside a tank. Hole spacing is measured from the centre of the two adjacent holes in the uprights. With commercially rated racks or any top rated rack the desired hole spacing is the Westside barbell spacing scheme, this is where the hole spacing is 1-1.5″ it should be within the deadlift bench and clean/pull areas.I was happy to see the SPR1000 incorporates this scheme in its design. The rest of the holes are typically 2″ apart. The reason whole spacing is so important is that its this distance between the holes that can effect reach, level of comfort and range of motion, doesn’t make an immense difference with squats but when its come to pressing its huge. This hole spacing may end up being a critical aspect in your ability to progress past training plateaus. I see this with many racks, they leave out the numbering of the posts, not a deal killer but something worthwhile doing yourself, its a pain in glutes having to count the holes each time you want to adjust the safety rods for certain exercises. Use a permanent marker or some paint to add your own. A 1000lb weight capacity should be enough for nearly all people lifting at home, can you see yourself lifting 1000lbs any time soon? I know I cant! 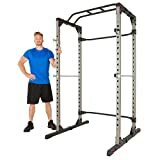 A 1000lb weight capacity should last most people a lifetime of lifting, sure there are guys out there who can lift more but for the most part, this rack should be suitable to everyone including the more experienced of bodybuilders and strength trainers. At this price you would expect to see the weight plate storage as standard, Body Solid offer weight plate horns to buy separately but I can’t understand why they wouldn’t supply 4 of them with the rack, all other racks at this price at least supply you with a set of horns. Horns are a vital part of any rack, it keeps weights out of the way off the floor and easily accessible to the bar on the rack. They do provide the 1″ standard pull up bar with this rack so at least that’s one attachement you don’t have to splash any cash on. SPR dip station– High-quality steel, lock in anchoring system will provide you with enough stability to take a lot of weight, “suitable for all weights and sizes” says Body Solid. Dips are one of the best exercises you can perform to build the lower pecs, shoulders and triceps when you train with parallel dips bars the angle and range of motion are different to push-ups and bench presses and unlike the push-up parallel bars provide no support, you are forced to lift your entire bodyweight. An exercise we should all include in our training schedule. Always a good idea to get yourself a dip station! We not all lucky enough to have 8ft ceilings and if you are on the search for a heavy duty rack specifically from Body solid for home use, then the GPR378 might be just what you are looking for. 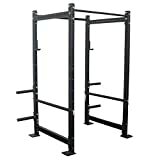 A sturdy well-built rack made with 11 gauge steel is a must see if you are thinking of buying a high-quality rack for home, because of its 11 gauge – 3″ x 3″ frame tubing it is rated for light commercial use and would be a fantastic durable addition to any home gym. 79″ tall frame will make sure this rack fits into most garages and basements. Summary An affordable heavy duty commercial rack with a 1000lb weight capacity, built to last and backed by a lifetime home guarantee and full commercial guarantee, this rack won't let you down. Many attachments are on offer to make the SPR1000 even more versatile. You can be sure you are buying a high-quality rack from a reputable company.